We arrived in Siem Reap on a Sunday afternoon, tired but excited to begin our adventure. 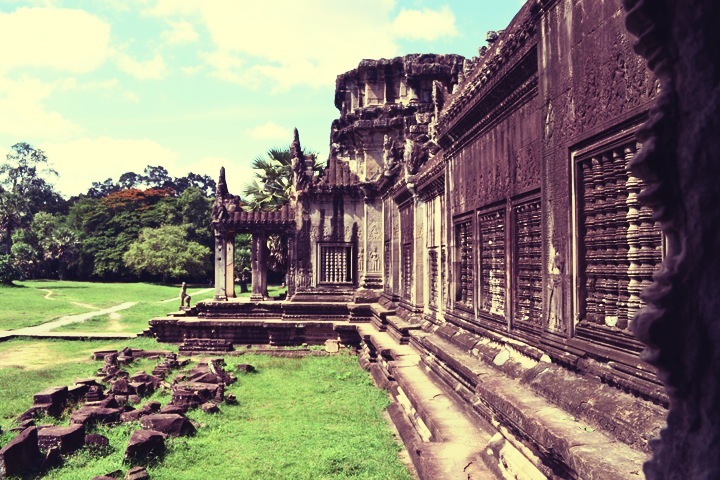 Ever since moving to Malaysia, I have always had it in my head to visit the famous ruins of Angkor Wat. I knew very little about this enormous temple complex, except that it was something worth seeing. I have never visited a country like Cambodia before and assumed it must be like Thailand. I was wrong. As soon as we arrived, we were immediately thrust into the craziness of this bustling Cambodian city. The streets were clogged with endless motorbikes piled with people and puffing smoke into the dusty air. Before reaching the heart of the city we drove down hastily paved roads surrounded by open countryside and wooden structures teeming with skinny animals and people going about their daily activities. I felt like I was back in China with its vibrant energy, unapologetic ugliness, and in-your-face attitude. This was going to be interesting. Dark shapes emerged from the trees, revealing themselves as the enormous stone mountains of Angkor Wat. As we got closer, I was astonished to find that it just got bigger and bigger. We passed by the surrounding moat which looked more like a lake and I found myself excited and overwhelmed by the sheer size of just the entrance gate. 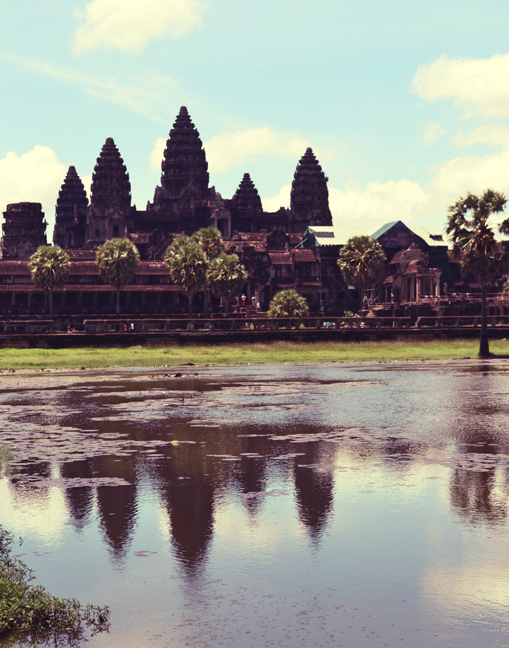 Even from afar, Angkor Wat was astonishing… and this was only one of more than one thousand temples in Siem Reap. Yikes! After settling into our plush room at the incredible Borei Angkor Resort & Spa, we took a tuk tuk to the Old Market area and walked around the various stalls before grabbing dinner. The next morning we were up bright and early to meet our tuk tuk driver who would take us to as many temples as we could handle during our first day. After purchasing a 3 day park pass (Carina almost got a discount because they thought she was Cambodian! 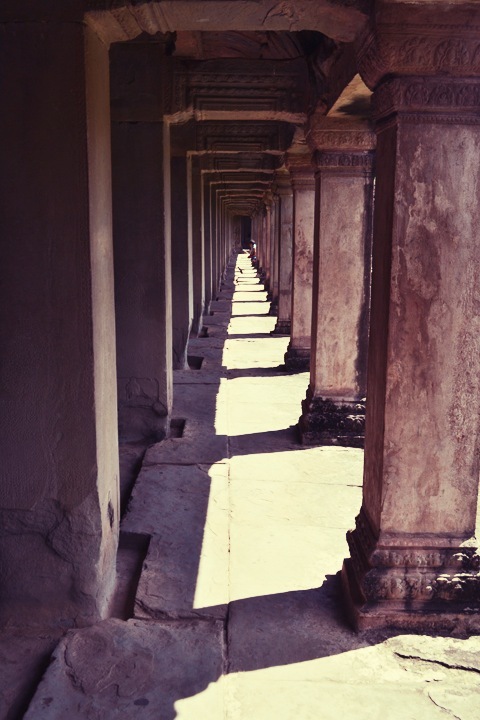 haha), we returned to the ginormous Angkor Wat complex, eager to begin. By 10am it was scorching hot and I was so happy to be wearing the elephant harem pants I bought the night before. Honestly I felt like a dork but when I realized that 90% of the tourists were wearing them as well I felt a little better. Unfortunately a few hours in I totally ripped the crotch of my pants while stepping up a high ledge. Awkward! Thankfully the hole was small enough and could not be seen (yet). After a few hours we were completely drenched in sweat and our sunscreen was streaming down our arms and face. 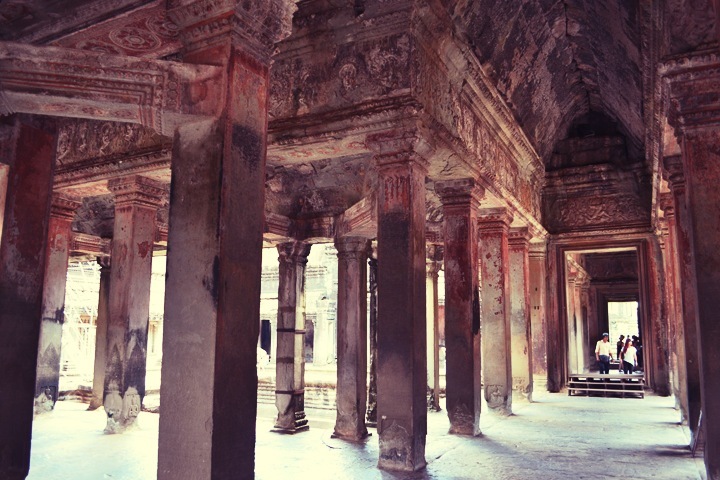 We found sweet relief inside the cool stone walls of the temples as we slowly made our way towards the heart of the Angkor Wat complex. Eventually we crossed the long and hot walkway to the central structure which is comprised of several levels that rise above to a central tower. Each level is higher than the last, culminating in a shrine that is 65m above the ground. These ascending levels are accessible only by steep stone stairs, representing the difficulty of ascending to the kingdom of the gods. Let me tell you, they sure were difficult and scary to climb! My ripped pants can attest to that. It is entirely possible to get lost in the cavernous stone hallways and we spent a lot of time roaming through those hallowed halls. With just the right light, they are a photographers dream! We also spent some time studying the intricate designs and murals of various Hindu and Buddhist stories carved into the stone. Such attention to detail on almost all surfaces of this enormous structure is entirely unfathomable. It was such fun imagining what this place must have been like back in the 12th century. After almost two hours, we stumbled upon my favorite part of the temple. Don’t ask me where it is because I have no idea! The walls of this airy hallways were a reddish color that was so lovely. 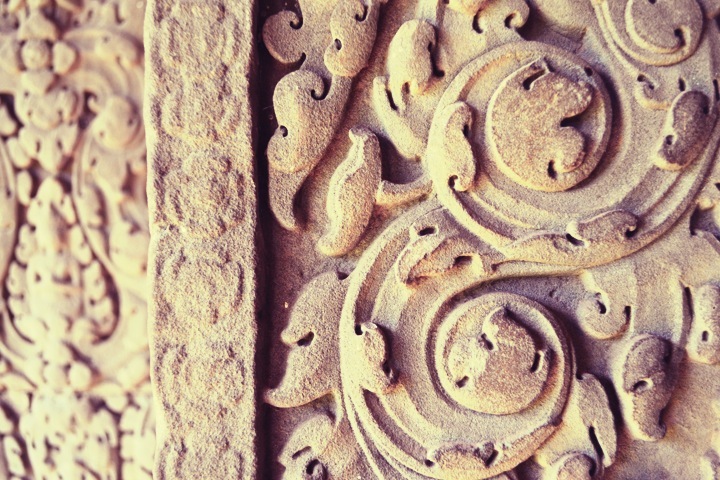 Many of the stone carvings were incomplete or had been reconstructed in the past. Over the years, different kings desecrated the depictions of Buddha and reworked them into Shiva, the dancing Hindu god. If you keep an eye out, sometimes you can still find depictions of Buddha in Angkor Wat that were overlooked throughout the years. Although there was still so much to see, we decided to move on to some of the other major temples besides Angkor Wat. It was barely noon and we still had a full day ahead of us! Next on our list? 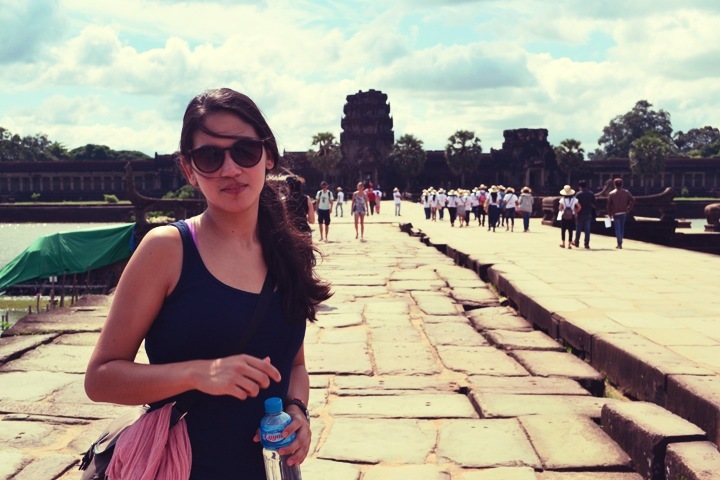 Angkor Thom! Our favorite temple complex of them all. Pictures to come soon! 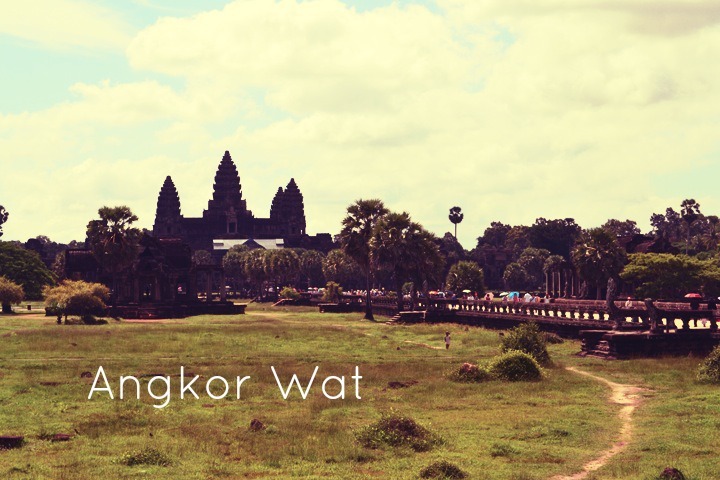 Angkor is very touristy, Siem Reap completely thrives on visitors. Thankfully we went during the low season so it wasn’t as crowded as I heard it can be! Your home country has been great so far. I absolutely love the food in Penang and am slowly getting acclimated to all that spice. I head back to the states today and am not sure if I will be back. Who knows what is next! You probably know that feeling as a fellow traveler and expat :-).